Always, put the fuse switch at the ON position. If you move the switch to the OFF position, some items such as audio and digital clock must be reset and transmitter (or smart key) may not work properly. 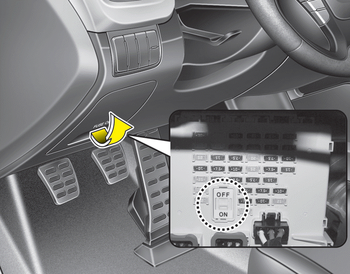 When the fuse switch is in the OFF position, a message "Turn on fuse switch" will illuminate on the cluster. Always place the fuse switch in the ON position while driving the vehicle. Do not move the fuse switch repeatedly. The fuse switch may be worn out. If you need to park your vehicle for prolonged periods more than 1 month, move the fuse switch to the OFF position to prevent the battery being discharged.